Selecting this option will present the user with the complete list of your albums, tracks or artists, depending on which tab you click. Selections are made by marking the tick boxes. 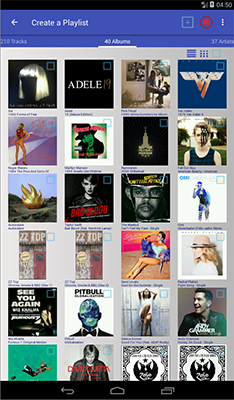 Once albums or tracks have been selected, click to add the selections. You will be presented with the "Add to Playlist" dialog where you can either select an existing playlist or create a new one. You are also able to sort your music collection by Artist, Album or Year either ascending or descending. 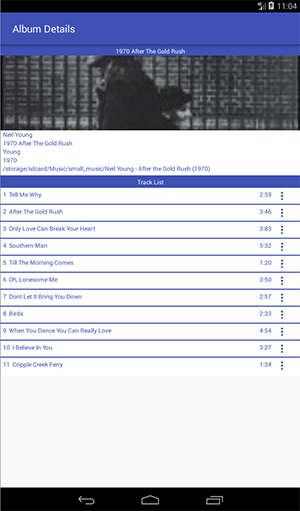 This screenshot displays all tracks found on your device. similarly, a click on an album will bring up the album details and tapping one of the tracks will start to play. A long click on the track will show the track details. select this option if you wish to simply let the app select a number of albums or tracks. You will be presented with a dialog box where you can either accept the default or provide your own name. Once accepted, you will see that the new playlist is being generated. The number of albums or tracks, as specified in Settings will be added. When you want to create a playlist but want to select the tracks according to some mp3 value/criteria. For instance all tracks from 1970, sorted by track number. Randomly mix tracks on a playlist. You can select more than 1 playlist. 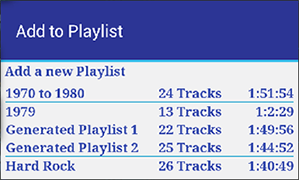 Remove any duplicate tracks on a playlist. You can select more than 1 playlist. 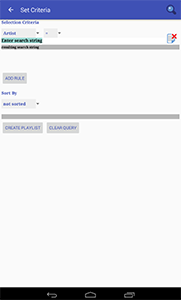 Export the android playlist to an interchangeable format. m3u is the univerally accepted format for non-proprietory playlists. The format is also used to integrate with Poweramp. Only ticked playlists will be removed. There is no confirmation. Delete all playlists in one go. You will be asked to confirm. Select this option of you wish to browse your local music folders. Behaviour to add tracks to a playlist is slightly different when you browse shares. mp3, m4a or flac content can be added through a long click which will invoke the playlist creation dialog. Single clicks will navigate through the folder tree. Long clicking a folder will bring up the "Add Playlist" dalog which will add all tracks within subfolders recursively. Select this option if you want to connect to a shared drive and create smb playlists. Please refer to the smb share page for further details. Note that smb playlists do not behave the same as local playlists. They will not show up in the android music environment and are written as m3u files to the folder playlist_manager. Long clicking a folder will only add tracks found within that folder. It does not add tracks held within subfolders. This is where you can create playlists based upon different mp3 tags. Clicking the appropriate item will populate the table. Playlists are created by simply clicking the selected item in the list. You will be offered the playlist creation dialog. If you have Poweramp installed then additional tags will be shown.Rating and "Times Played" are not available in android but are obtained from your Poweramp music collection. By clicking the the selection popup menu will show again. Standard Android options are Artists, Genres, Years, Composers and Decades and additional mp3 tags depending on whether you have Poweramp installed. An additional option is listed called "Smart Playlists. The choice allows the user to build their own query by supplying a combination of one or more criteria. For more details follow this link. A number of options are available to customize the behaviour of the app.